Eight Chemistry teaching faculty and one undergraduate travelled to Seattle to join the Western States Chemical Education Group conference last weekend. While the major themes of the meeting were inclusion, diversity and access; posters and talks were welcomed on all aspects of chemical education. We enjoyed a talk by Scott Freeman (of biology textbook fame), who spoke about the success rates of different groups of students (e.g. socioeconomic background, race, gender, family history of tertiary-level study) and our collective need to narrow these “success gaps”. UBC represented strongly; we provided about a quarter of all the presentations! We covered topics as diverse as acid-base concept tests, the nature of Science One, upper-level laboratories and their experiments, materials chemistry in the curriculum and student workload in flipped organic chemistry classes. Many thanks to the University of Washington Chemistry Education Research Group (ChEdR) for hosting the meeting this year. Sydney Inthof presented a progress report of the research she is conducting with me in her CHEM 445 Research Learning Experience course. Her main goal for this year is to gather content validity evidence regarding our acid-base concept test which has been in development since Jessie Zhang worked on the project during the 2016-2017 academic year. Jessie conducted several student interviews, which identified alternate ways of thinking in our second-year non-majors students. Now, the inventory questions are being examined by organic chemistry experts, mostly faculty members, who are rating the importance and relevance to chemistry majors and non-majors, indicating the year in which the content is covered, and estimating the difficulty for students. Experts are also providing very useful feedback on question wording and the chemistry content covered. We have one item with quite a bit of expert disagreement, so we will replace it. This project is a challenge for us because we want to tap into students’ conceptual understanding using some unfamiliar chemistry, so they cannot answer based on memorization. However, we need the chemistry to be unambiguous and of course, correct! Jackie will be presenting this work at the upcoming ACS Spring meeting, and Sydney has submitted an application to present at the Western States Chemistry Education Group meeting. Davis, L. L. (1992). Instrument review: Getting the most from a panel of experts. Applied Nursing Research, 5(4), 194-197. Polit, D. F., & Beck, C. T. (2006). The content validity index: Are you sure you know what’s being reported? Critique and recommendations. Research in Nursing & Health, 29(5), 489-497. On February 15th, the Department’s Science Education Specialist Dr. Jeanette Leeuwner presented an overview of UBC’s new CHEM 100 course, Foundations of Chemistry. CHEM 100 was created to prepare students for first-year chemistry (CHEM 121 and 123) at UBC. Students without Grade 12 chemistry (or equivalent) write the Chemistry Basic Skills Test (BST) and are placed into CHEM 100 or CHEM 111 depending on their results. CHEM 100 covers topics such as atomic and molecular properties, nomenclature, chemical reactions, the periodic table, bonding and intermolecular forces, acids and bases, and equilibrium. Students in CHEM 100 have a wide variation in their chemistry backgrounds, which makes designing instruction a challenge. To address this challenge, Jeanette used Pearson’s Mastering Chemistry online homework software to provide students with ample practice and feedback. A variety of group and other active learning activities were also incorporated in class to give students immediate feedback on their progress and understanding. In the future, the impact of CHEM 100 on subsequent chemistry courses will be evaluated. I presented on behalf of Sydney Inthof, a Research Learning Experience (CHEM 445) student working on conducting validity and reliability studies of an acid-base concept test. The test was first developed by directed studies student Jessie Zhang in 2016-2017 (supervised by Jane Maxwell and me). The concept test measures students’ abilities to rationalize the strength of acids and bases qualitatively. This is an important reasoning skill commonly taught in second-year organic chemistry courses. Like all concept tests, it has the potential to be used for assessing changes to curriculum and pedagogy in university chemistry courses. This year, Sydney is focussing on gathering content validity evidence from chemistry experts within and outside of UBC. My presentation provided the group with an overview of educational measurement concepts, including reliability and validity. We discussed the draft expert online survey which we are refining to ensure experts can easily review the content in all three tiers of the test items. Presenting the content visually is a challenge for multi-tiered concept tests. Yanru (Jessie) Zhang presented this work at the 2017 Canadian Chemistry Conference and was awarded the 2nd-place student oral presentation award. Congratulations! Ian Park, an undergraduate student enrolled in CHEM 445: Research Learning Experience, provided an overview of his project. His main project goal is to use Alchemy to deliver practice exam content to Chemistry 233 students. Alchemy is an online learning tool that develops students’ critical thinking and decision making skills, and has powerful feedback capabilities. Our rationale for using it to deliver practice exam content is to motivate students to attempt problems themselves before checking the answer key, and to provide opportunities for students to correct misunderstandings and enhance conceptual knowledge. The Alchemy project is led by Dr. Russ Algar and is funded by the UBC Teaching and Learning Enhancement Fund. I was invited to attend the NSF-funded TRESTLE annual meeting, which took place last week at the University of Kansas. TRESTLE (TRansforming Education, Stimulating Teaching and Learning Excellence) is is a multi-institution, NSF-funded project for improving STEM education through discipline-based education experts and other models. Gülnur Birol and Warren Code of Skylight lead UBC’s involvement in the network. UBC’s main role in the project is to act as a mentor institution, sharing the lessons learned from the Carl Wieman Science Education Initiative (CWSEI). TRESTLE is affiliated with the Bay View Alliance, of which UBC is also a member. I presented the Chemistry 233 Choice Project at a round-table teaching demonstration (thanks to Jane Maxwell for helping me design this assignment). As I anticipated, the group was somewhat interested in my assignment and VERY interested in the ComPAIR software I use for peer review. The existence of TRESTLE and other networks is an indication that the rate of transformation of higher education STEM courses and departments is increasing. Momentum is building! There are several models for STEM course transformation. Three common models are: 1) Discipline-based experts (PhDs in the STEM discipline with training in how people learn and course design/assessment work with faculty as catalysts for change – the model used by the CWSEI 2) Faculty members from Education units partner with STEM faculty, and may work with graduate students to carry out course transformations – a model working well at UTSA, and 3) Teaching-focussed permanent faculty members drive course transformations in their departments – this is the model adopted by UC Davis. My epiphany at the meeting was that there are several models for course transformation, and if a model doesn’t appeal to a particular department or isn’t working, maybe we should consider switching models instead of trying to convince faculty members to work within the model that isn’t easily adopted. I spend a lot of time thinking about theories of learning, but hardly any time thinking about theories of pedagogy. It was a pleasure to meet Joan Middendorf from Indiana University and discuss the pedagogical theory she has developed with her colleagues, Decoding the Disciplines. I am eager to read her new book, Overcoming Student Learning Bottlenecks. A fellow workshop participant identified as a “warm demander” and we had an interesting discussion about how this concept has helped her balance her desire to be supportive and also have high expectations for students. KU has developed a rubric to evaluate teaching effectiveness in a project led by Andrea Greenhoot and funded by NSF. This rubric looks very useful for formative and summative reviews of teaching at UBC. I am looking forward to seeing more encouraging results from TRESTLE-supported course transformations! Those involved in chemistry education research (CER) met at our inaugural department-wide CER group meeting Monday Sept. 10th, 2018. Anka Lekhi presented some of her work investigating the relationship between first-year international students’ personal epistemologies and problem solving approaches. She found that students’ successful completion of a conceptual problem in chemistry is positively linked to the student view that conceptual understanding as more important than pattern-matching approach. The results of her work suggest that chemistry educators should be explicit about the benefits of conceptual understanding and the purpose of learning activities in developing personal epistemologies. For example, it is worthwhile to foster students’ beliefs that their peers are a source of knowledge, as this will help them in their studies. I wish everyone a great term! Years ago, UBC’s non-majors Organic Chemistry course, CHEM 233, used to strike fear in the hearts of undergraduates. However, Ubyssey reporter and recent CHEM 233 student Rocio Hollmann suggests that recent changes to the course, including the adoption of a “flipped” learning sequence, have rendered that reputation obsolete. Read the complete article to learn more about CHEM 233 and student perspectives on the course. An article describing the development, testing, and evaluation of a new guided-inquiry experiment for UBC’s second-year analytical chemistry course (CHEM 211) has just been published in the Journal of Chemical Education! The CHEM 211 labs have seen many exciting changes over the past few years, including the introduction of several guided-inquiry experiments in which students research and develop their own designs and procedures for tackling an analytical problem. In the “Build your own Photometer” experiment, students research fundamental concepts in spectrophotometry, then apply their findings to design, build, and test a submersible photometer that can be used to monitor colour-change reactions such as titrations. You can read all about the experiment here. This experiment and article are the products of a collaboration between Instructional and Research Faculty, students, and the CWSEI. Dr. José Rodríguez Núñez (CHEM 211 lab director) and Dr. Russ Algar (CHEM 211 instructor and research faculty) developed the concept and basic plan, Jessie Wang (a UBC chemistry undergraduate) developed and refined the procedures, and I interviewed and surveyed students in order to evaluate the success of the experiment. I’m very proud of the resulting article, and of the fantastic collaboration that made it happen. 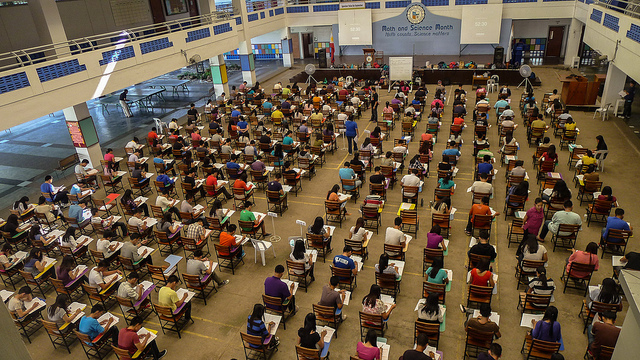 How can the design of an exam affect what it measures? How can we tell if an exam has met its goals? What can we learn from an exam once it’s over? Full slides from the workshop are available here: Examining Exams.